Old Gewurztraminers do not die, they are just reborn. The young wine is often over the top with roses, red apples, banana and spices and a jammy sweetness on teh palate. But over time, the sweetness decreases in response to a polymerization reaction. 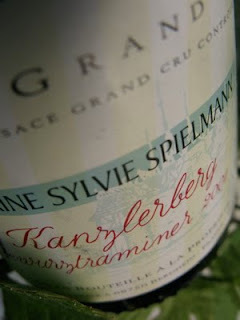 At Grand Cru Kanzlerberg in Bergheim, Sylvie Spielmann shows off her great skill and creates long-lived, superb wines with superior backbone. 2001 Gewurztraminer Grand Cru Kanzlerberg has a golden yellow color with green tints despite eight bottled. The aroma is lush and complex with honey, pepper, mint, apricots and millions of other scents. The taste is supple but elegant with a velvety structure and a mild sweetness balanced by fine acidity and a touch of bitterness. Price: € 16.00.